On a creepy Halloween night, the neighborhood comes down with alien fever when Arnold and Gerald broadcast a mock radio show warning of a spaceship landing. 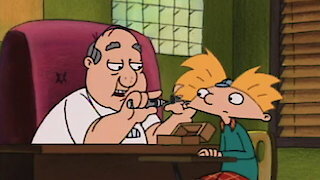 Hey Arnold!, Season 4 Episode 1, is currently available to watch and stream on Nickelodeon. You can also buy, rent Hey Arnold! on demand at Amazon, Hulu, Vudu, Google Play, iTunes online.